We all love a good story, and some tales are bigger than others. Such is the case with Spreckels Theatre Company’s production of the Broadway musical Big Fish (running from August 12 – 28). If you’ve seen the Tim Burton movie, you’re sure to love the play. And once you’ve seen the play, you’ll want to see the movie again. Emotional and heart-warming, the story focuses on the relationship between father and son. Edward Bloom is a traveling salesman who has a propensity for spinning stories to mythological proportions. The production revolves around his son Will’s yearning to to truly know his father, to uncover what is truth and what is fiction. The story shifts through two timelines, past and present. 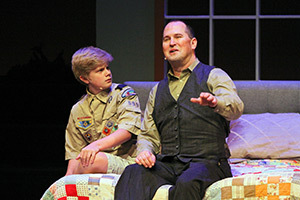 In the present, the audience watches an older Edward interact with his frustrated adult son. In the past, the audience relives a young Edward’s adventures involving a mermaid, a witch, a giant, a circus, and falling in love at first sight. Through it all, the audience begins to find glimpses of truth in the impossible, and the hero that is kept secret. Darryl Strohl-DeHerrera, Mark Bradbury and Heather Buck star in this musical expertly directed by Gene Abravaya. When you go, prepare to experience a full range of emotions, from laughter to tears. 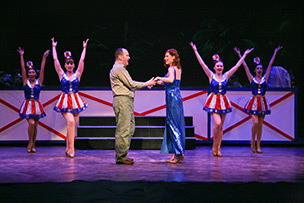 The entire cast worked as a great team to deliver fine performances. Some of my favorite moments were Buck in the musical numbers “Time Stops” and “I Don’t Need a Roof.” Buck did a stellar job as Mary Poppins at Spreckels last season, and her star quality continues to shine. Once again, I was captivated by her ability to make the story poignant and intimate on stage. Choregrapher Michella Snider and Costume Designer Pamela Enz worked their magic again. I especially loved the Witch Sequence. 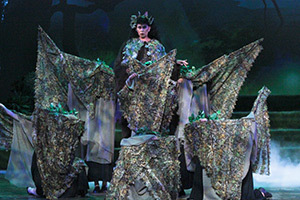 The blend of powerful singing by Serena Elize Flores with actors dancing and camouflaged as trees was remarkable. Once again, Bobby Finney delighted audiences as Karl the Giant. Some of the funnier aspects of the play were brought to life by clever use of Spreckels’ specially developed Paradyne projection system. This system combines still images and animations to create multiple backdrop effects. When you go, be sure to watch for the human cannonball scene—it’s a hoot! In its 22nd year and with over 20 awards from the San Francisco Bay Area Theater Critics Circle, Spreckels offers award-winning theatre, music and dance. More than 20,000 people attend plays at Spreckels every year from all over the bay area. The theatre company was especially pleased with record-breaking attendance for the production of Disney’s The Little Mermaid last season. Big Fish opens the Spreckels 2016 to 2017 season. Just like Big Fish, all the following productions are also North Bay Premiers, shows that have never been done in this area because of their magnitude and particular demands. Audiences can look forward to Baskerville; A Sherlock Holmes Mystery; Titanic, The Musical; Peter and the Star Catcher; 1776; The Sugar Bean Sisters; and Disney’s Tarzan. To buy tickets for Big Fish or for upcoming productions at Spreckels Performing Arts Center in Rohnert Park, visit www.ci.rohnert-park.ca.us/city_hall/departments/spreckels_performing_arts_center or call (707) 588-2226.